The Christmas season can be such a difficult time for so many. With a season that is filled with so much hope and expectation, it can feel like such a lonely place when you are grieving the loss of your little one. I remember the first Christmas after we lost our three babies. It was a hard season. We had just moved, I just had knee surgery and our most recent loss had only been three weeks prior on Thanksgiving. For me it was not a season of hope and expectation. It was a season of grief and loneliness. I felt forgotten and even worse, I felt like our babies were forgotten. Despite my family and friends trying to love me well, I had felt forgotten by God and that was the worst feeling and the worst kind of loneliness. With the advent season among us, I wanted to work through some thoughts I have on how to get through the holiday season as you continue to grieve and figure out what this Christmas looks like with this big hole in your life. Friends, if I could give you one piece of advice it would be this. Jesus is our source of comfort, hope, and peace. This Advent season is ALL about Him! There are SOO many free studies online you can work through as you look to the birth of Christ and hope that is found in Him. Though I am a few days behind getting this out in time for Advent, you can still jump into ANY of these resources! One in particular is from The Joyful Morning. This is a beautiful online community whose purpose is to encourage mamas walking through loss. Ashlee Proffitt (the Founder) has written an Advent Devotional delivered straight to your inbox when you sign up! Or you can head directly to the blog and read through it there. Her words bring so much comfort and hope as she points to the hope we DO have in Christ and what this Advent season means to the mama who is grieving. Burden Bearing Baskets is a new shop I recently found on Instagram. This year they created a beautiful and extremely meaningful Advent Calendar for a mama who is grieving. As I read through it, I was so encouraged by each “call to action” for each day. So many beautiful ways to walk through this season with meaning and reflection. Another short but solid option is the Solid Joys Daily Devotional by Desiring God on Advent. This is not specific to grief but would be such a great way to get into the word! This one is in podcast form so it’s easy to listen to listen to while doing house work or on your way to work! And friend, I also don’t want you to feel the pressure to study Advent. Getting into the Word is what is important. So if this is an area that you want to work on, but don’t necessarily want to study Advent, I encouraged you to read through the Psalms! Read one or two a day (or more!) and look for the character of God. The work He has done and how the different writers of the Psalms responded to that work. In a season of darkness and grief, we need to take our eyes off of our circumstances and lift our eyes to Christ. He is the ONLY one who will help you through this season. Even if you read through the rest of these ideas and implement them, spending time in HIS word is what will truth help you through. So even in the sorrow and the unknown, let’s work together to be intentional about seeking Christ! A dear mentor and friend I have had over the last few years has always encouraged me to write out a list of things that bring me joy. Things that I find delight in and bring refreshment! She then challenges me to do at least one each day. When we delight in the things that God has given us, we delight in Him! It is a good thing to enjoy the things God has created us to enjoy! It will be different for each person but that is the beauty of how we were created! As you walk through the coming weeks, I want to encourage you to take time each day to do something that refreshes you! Whether that is with someone or alone, make this a priority! I am praying that as you do this, you will draw strength from the Lord to endure the hard and difficult moments. Know that in Him you can ALWAYS find refreshment! Hitting up Sephora and buying new makeup and skincare! I do this once a year and it’s something I greatly look forward to each time! A good, cheesy Christmas Hallmark movie! Sitting with my mentor over tea and treats. She is one of the few people I know who loves tea as much as I do so it is ALWAYS a joy and delight when we get together! 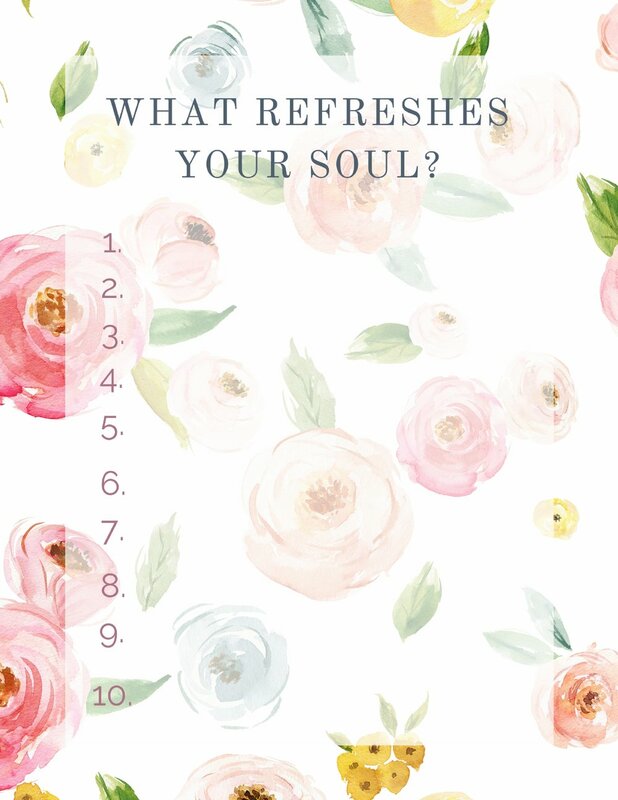 Here is something you can download and print to write out what refreshes you and hang it somewhere you will see! Who knows maybe your hubby will see it and pick one or two ways to refresh you! Recently I attended a workshop of sorts at my church where we talked through stress, anxiety, and overwhelm. One of the things I walked away from was to walk through the scenario that you are in and decide ahead of time what your options are. When you think through the scenarios and what the different outcomes could be and what your options are, it gives you the power to walk in them. You face them head on with a plan and you are more likely to walk away feeling protected and in charge of your emotions and responses to others. When you have a plan you keep the enemy from taking hold of your thoughts and your emotions. Sister, this Christmas season, let’s work together to find the good things in our lives amidst the heaviness of loss. Below I created a list you could print out and put in a place you can see and add to it throughout this season! Encouraging someone else always feels good right? This season, take a few minutes to send a snail mail note to a friend who might need it or spend 10 dollars or so on a gift for someone dear! It doesn’t need to be extravagant just a small way to say, “Hey! I am thinking about you and wanted to bless you in this small way!” The Burden Bearing Advent Calendar has days where they guide you in doing this! It is such a great way to love someone else and to have eyes for those around us who might be in a season of suffering! I think one of the most challenging aspects of Christmas is the feeling of being forgotten. I would encourage you to find a way to remember the life that was lost. Whether that be lighting a candle, having a tiny Christmas tree set apart as a way to remember. Something that you can visibly see and tangibly touch that will allow you and your family to talk about and remember your little one. I know this season is a hard one. At times even seems unbearable to get through. But friend, the LORD will walk you through it! Know that I am praying for you and you have a community of women right alongside you walking this road as well. You are not alone!